Investors still too bearish on stocks according to sentiment evidence. 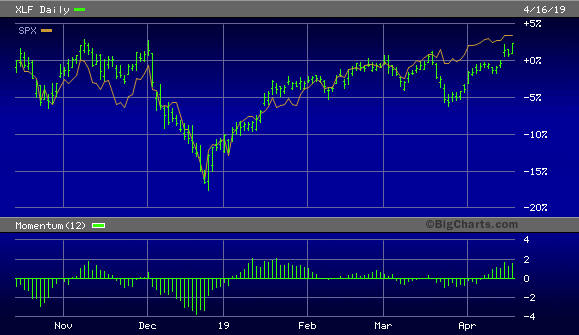 Short interest on S&P 500 also high, which could fuel a big rally. Plenty of cash still on the sidelines could also fuel a melt-up. The continued lack of confidence in the U.S. equity bull market extends far beyond a simple skepticism over elevated stock valuations. Investors are worried over a variety of factors ranging from the economic health of the eurozone, the possibility of a U.S. economic recession, and ever-rising U.S. wages. Yet this growing list of worries highlights a salient feature of the market’s sentiment profile and suggests that the bull has a lot further to run in the months ahead. In today’s report, we’ll look at reasons why the market is more likely to experience a “melt-up” than a meltdown. If there are any doubts that negative sentiment still prevails in the financial press, a brief survey of the latest headlines will dispel those doubts. One such example was seen on Tuesday in a CNBC article. It seems that Wall Street’s new favorite pastime – watching for the next recession – has found an ally in the well-known economist Paul Krugman. The Nobel Prize-winning economist said China’s economy was struggling while the eurozone economy may have already entered recession. He further said the U.S. could enter a recession within the “next year or so,” and that corporate debt and a collapsing tech bubble could contribute to it. Barely a day passes without a litany of economic concerns being voiced in the popular press. In recent years there have been a plethora of articles which lament the lack of wage growth for U.S. workers. But with the U.S. employment rate near all-time lows, a new concern is being voiced: rising wage growth. 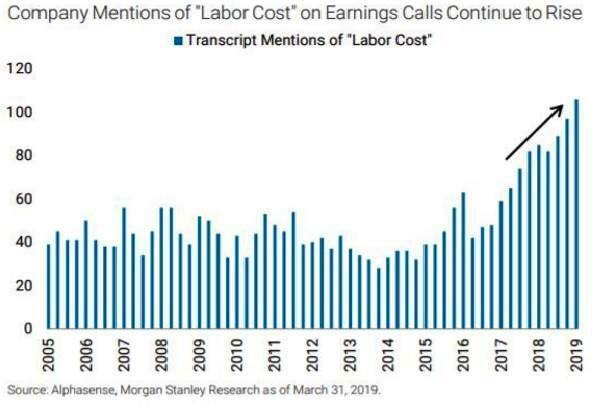 This concern was given voice in a MarketWatch article by Chris Matthews, who pointed out that wage growth is accelerating. This is yet another example of the fear-driven mentality on Wall Street, which is good news from a contrarian perspective. In recent reports, I’ve made the case that investors and analysts are still too nervous despite the major averages being so near all-time highs. This suggests that the new phase of the bull market which began earlier this year is still quite young. The widespread reticence also implies that stocks are having a lot more upside potential before investors finally capitulate and go all-in as buyers. Only when the majority of participants have shed their apprehension toward equities will the bull market be in any serious danger. Fink also said that a globally synchronized “melt-up” of stock prices is more likely than a meltdown before the market’s next correction occurs. He based his prediction on the Federal Reserve’s dovish turn earlier this year, which he said creates a “shortage of good assets,” thereby encouraging investors to move into the equity market. I concur with Fink’s assessment of retail investor sentiment and with his view that a stock market melt-up is more likely than a melt-down. With the momentum of equity prices continuing to increase on the upside, stock prices are more likely to go up than down in the course of the next few months. Combined with investors’ pessimism toward the financial market and the economy, there is more than enough short interest to fuel another major rally this year. It could also feed the melt-up scenario as discussed here. Let’s examine the two components of the market’s next potential rally mentioned above. In terms of momentum, there is a continued upward trend in the NYSE 52-week highs and lows which reflects rising incremental demand for equities. 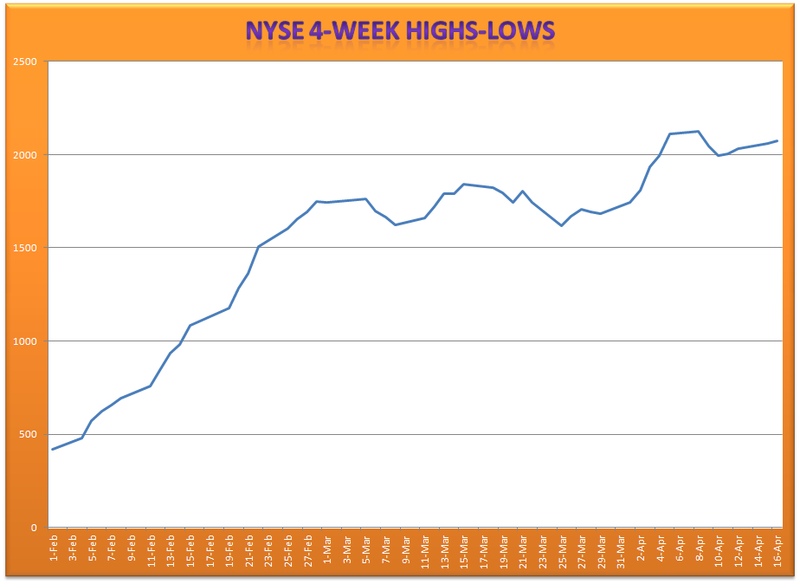 Shown here is the 4-week rate of change (momentum) in the new highs-lows. This indicator points to the stock market’s near-term path of least resistance. The momentum of the highs-lows has been rising all year and supports the bull market’s continuation. Meanwhile, on the sentiment front, many traders and investors continue to embrace a bearish outlook on the stock market. According to data provided by DailyFX, only about 28% of retail traders were bullish on the S&P 500 as of Apr. 16, compared with 70% bearish. 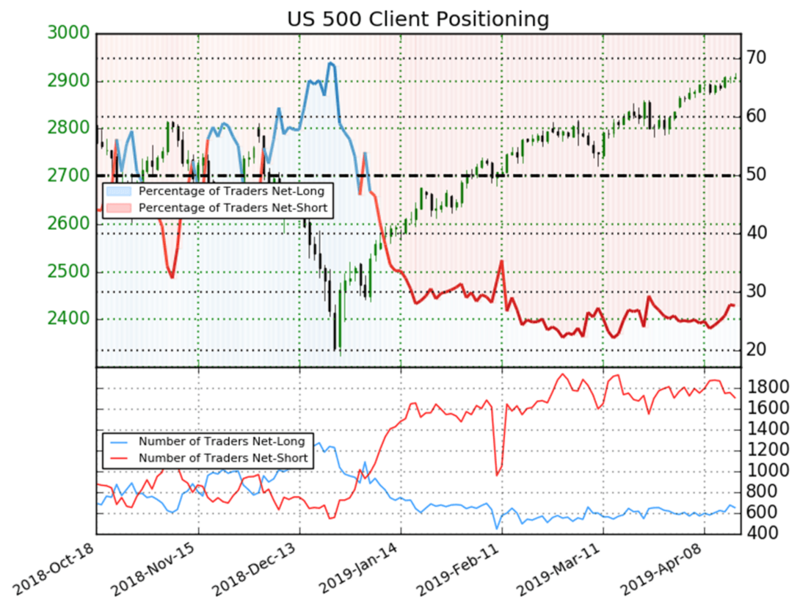 This suggests there is still plenty of short interest to serve as a fuel for a series of short-covering rallies in the coming weeks. With the major indices being so close to all-time highs, why then are so many participants worried? I suspect that one reason for the lack of enthusiasm is the lagging nature of small-cap stocks as reflected in the Russell 2000 Index (RUT), which is shown below along with the S&P 500 Index (SPX). The Russell is the only one of the few major indices that didn't experience a strong rally in the February-early March period. The pattern visible in the daily chart has taken on the appearance of a lateral trading range since late February. Keep in mind that a range-bound market tends to dampen investor enthusiasm, especially where the small caps are concerned. It's also worth mentioning that most retail investors are more likely to be involved with small-cap stocks than large caps. Thus, the lack of forward movement in the small caps since late February may have blunted investors' hunger for participating in the rally in large-cap stocks as reflected in the SPX. Nonetheless, I expect the small caps to eventually catch up to their large-cap brethren by later this spring. The fact that the small caps have conspicuously lagged the SPX isn’t likely to escape the attention of retail investors when they finally shed their fears and look for places to invest their sidelined money. Another possible reason for investors’ reticence toward equities this spring is the fact that financial stocks also lagged the S&P 500 for much of the past month. 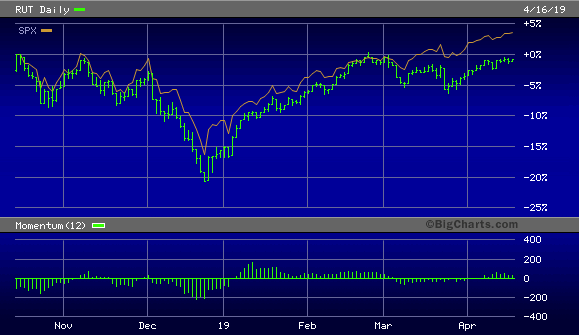 This can be seen in the following graph which compares the Financial Select Sector SPDR ETF (XLF) with the S&P 500. And yet the gap between XLF and the SPX is rapidly shrinking as several leading bank stocks have rallied during the latest earnings season. I expect the financial stocks to catch up with, and eventually surpass, the SPX in the coming weeks as bank earnings continue to impress. All in all, the combination of negative investor sentiment, rising short interest and strong internal momentum should combine to produce a power rally at some point in the coming months. This combination of bullish factors even has the potential to produce a “melt-up” in the stock market, which is the opposite scenario of what many observers expect. Data also suggests there’s still plenty of cash on the sidelines that can be allocated to stocks and fuel a melt-up, especially if positive earnings surprises continue to attract attention to overlooked companies. In view of this, investors are still justified in maintaining a bullish stance toward equities. Only when sentiment becomes ebullient will there be a reason to look elsewhere beyond the equity market for investment opportunities. On a strategic note, traders can maintain a long position in my favorite market-tracking ETF, the Invesco S&P 500 Quality ETF (SPHQ). I suggest raising the stop-loss to slightly under the $31.40 level for this ETF trading position on an intraday basis. Only if this level is violated will I move to a cash position in my short-term trading portfolio. Meanwhile, investors can maintain longer-term positions in fundamentally sound stocks in the top-performing real estate, consumer staples, and financial sectors.